for $699,900 with 4 bedrooms and 3 full baths. This home was built in 1960 on a lot size of 23.94 Acre(s). Spectacular Mid Century Modern home designed by noted Augusta architect, John Sanerforf. 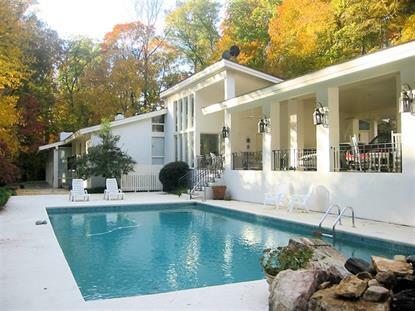 Modeled after a Frank Lloyd Wright style home, this stucco home is situated along a rocky creek. Home is known as Cedarside, this spacious home has stunning views from every room. Glass paneled sliding doors open from each room onto the flagstone patio and sunlight floods the interior. Solid Cypress paneling grace the Formal Living room and Dining Room. Living room has large mirrored section above the fireplace, Dining room wall is lined with MIrros Paneling along one wall. Terrazzo Floors throughout the first floor of Den, Kitchen, Licingroom and Dining Room. Huge Master Bedroom with deck over looking the unground pool and stream that runs along the edge for eh woods. Pool diving board is a slab of rock from the creek. Large Den with Tile floors and 3rd fireplace is currently sued as an office. Sauna Room with Jetted tu, shower, sky lights, and entry to an outdoor shower. Second Kitchen near 6 car carport with loggia at end which overlooks the pool house, creek and garden area. Call today. Listing data provided courtesy of the Internet Data Exchange Program of the MLS of Greenwood SC Inc. The data relating to real estate for sale on this web site comes in part from the Internet Data Exchange Program of the MLS of Greenwood SC Inc. Real Estate listings held by brokerage firms (licensees) other than Weichert Realtors include the name of the listing brokers.